GreenBayNightLife.com Green Bay Restaurants, Bars, Bands, Events Calendar > Green Bay Restaurants > American > 4C's Packer Burger Co.
A Contemporary Asian American Grille that serves both Chinese food and burgers. It is a mix of Asian cuisine with American grille. This restaurant used to be across the street and was named Lee's Mongolian Barbecue; where there was the BEST egg foo young in town. Now that the restaurant has moved and changed names they STILL have the best EFY in town ! If you like burgers then their Packers Burger are absolutely delicious. Sometimes the atmosphere is as important as the quality of food and this place is usually quiet unless the waiter get to talking ! He is absolutely fun to talk with and I don't mind that he stands there and chats all the while I am enjoying my meal. Not to mention the prices are pretty inexpensive but the food tastes good. Bon appétit ! I was very happy with the service and the quality of food that was served at 4C's.The drinks are awesome and everything is priced. You do not need to take out a loan for your meal. It is great!! 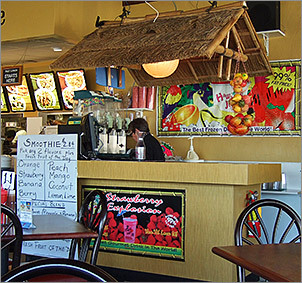 This place has great and inexpensive lunch and dinner items that let you choose combinations of their prepared items. It might not be the best chinese food I've ever had, but the price reflects that. It's also great for takeout and delivery. They also have a large bar inside and serve tropical drinks. I found the service to be very friendly. Same food, different venue. Fried rice was loaded with soy sauce, turned the rice dark brown, and no other flavors could be detected. Thick, gummy sauces all taste the same. Don't waste your time here, go to Lotus for some much better asian and thai cuisine. Map of 4C's Packer Burger Co. I went to lunch at 4C's restaurant, which is located on the far east side of Green Bay. The decor and the menu has a theme of East meets West. 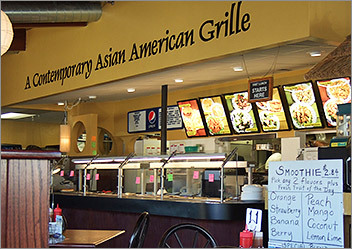 It is a mix of Asian cuisine with American grille. The restaurant has high beamed wooden ceilings with white paper lantern lights hanging from them. Next to the register is a long food bar set up for a quick lunch, versus off the menu. With the quick lunch you can select four items for $6.00 or three for $5.00 which includes white rice, they also feature hot dogs and hamburgers on their lunch bar. There are no booths but plenty of tables for seating. There is also a large full bar with several flat screen TVs to the right of the dining area. Between the bar and lunch buffet is a small stand with a straw roof where you can order a fruit smoothie or a tropical cocktail. It is very clean and bright since they have a 180 degree view with large windows. They also have a nice sound system that had smooth jazz playing in the background. I decided to order off the menu so I started out with two spring rolls for $2.00 each and the Kalbi Chicken for $5.00. My server was very friendly and also very helpful at explaining different items on the menu and how the buffet worked. My spring rolls came out first with 3-4 packets of hot mustard and there are also condiments on each table of sweet and sour sauce, soy sauce, extra napkins, and ketchup. My spring rolls were very large they were deep fried to a light golden brown and filled with a seafood and vegetable mixture of baby shrimp and crab meat. They had a wonderful flavor and were light and crispy. Next I was brought out a side dish of white rice and on a separate plate my Kalbi Chicken. 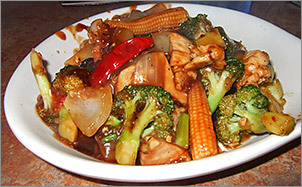 The sauce was slightly thick and tasted sweet and tangy.The dish was a mixture of broccoli, baby corn, Napa cabbage, and chicken it was very savory and full of flavor. 4C's has a little of everything so as to please everyone's palate, from burgers to steaks to various styles of Asian cuisine.